Finally available is the new EP from Polish artist Bartosz Dziadosz aka pleq, featuring one track for which I recorded some multi-tracked cello parts. It's a beautiful slowed-down remix of a Ben Lukas Boysen (aka Hecq), the original piano augmented by French pianist Julien Marchal. The overdubbed parts were improvised in our respective studios by us, and Bartosz added washes of sound and extra-twinkly production. A video of our track was made by Ken Hirama. A couple of years ago I recorded an album over two weekend sessions at the beautiful Music Feeds Studio, with engineering and mixing help from Chris Hancock. It's less electronic than a lot of my other stuff – much of it was aimed at realising my multi-layered looping pieces in lush acoustic multi-tracked recordings. But the other half are extravagant pieces jammed, overdubbed, mixed and overdubbed right there in the studio. I'm yet to release the album – entitled the night is dark, the night is silent, the night is bright, the night is loud. Once I've remixed a few tracks a little bit, I'll send it out into the world (maybe a like-minded label will help me there)… In the meantime, you can stream this track, which mixes up faux-guitar cello, rapturous arco fragments, helium harmonics and a couple of field recordings. I've been working on some music in collaboration with Damian Gascoigne, who, as well as being the director of UTS's Bachelor of Design Animation, is a talented and groundbreaking animator in his own right. 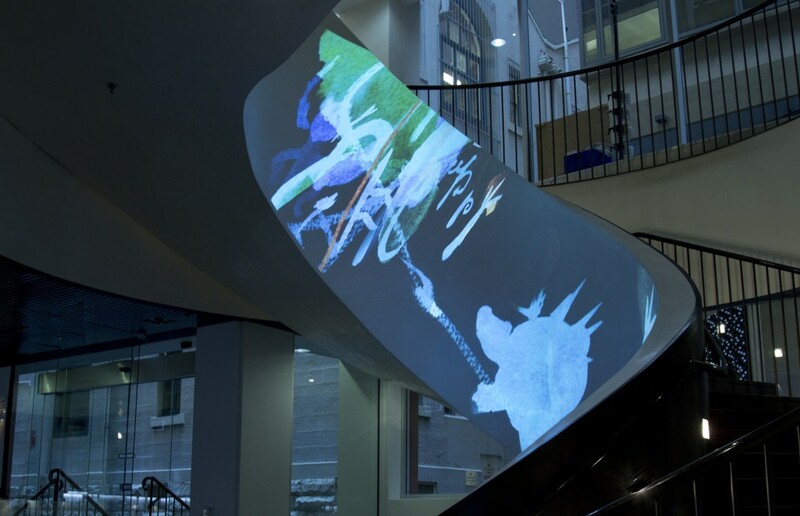 The first public fruits of his current work are currently showing as a projection-mapped installation on the beautiful spiral staircase inside Customs House in Sydney as part of SuperLux (Smart Light Cities) – and you should be able to hear an ambient looping version of my music as part of the installation. I was recently asked to perform with the wonderful Lisa Gerrard of Dead Can Dance at the annual TEDxSydney. After some brief email conversations, we met the night before the event, had a chat and determined that it would be as spontaneous as possible. We discussed a few ideas, soundchecked, and that was it! On Friday the 19th of December I'm supporting and playing with Ben Fink & Dale Caldwell's sparse anti-folk act Close to Forever. Should be a magical evening. And on January 30th (also a Friday), I'll be playing a quite different gig courtesy of Tenzenmen at Black Wire, supporting Hinterlandt Ensemble and Beijing's Guiguisuisui, rounded out by Milkk. Can't wait! I've been recording at the old Megaphon studio in St Peters – now Music Lines – with the fabulous Mr Chris Hancock, towards a new album. This time I'm looking at sending it out to some like-minded labels rather than self-releasing. Perhaps half the tracks are loop-based works painstakingly rendered in ProTools, and half are entirely studio-created, composed on the fly on cello, piano, pieces of metal and wood, synthesisers, out-board effects and computers. It's been exhilarating and we haven't even started mixing yet! While travelling in the US in November, I played a few fun improv gigs with different people, did some recording for my friend Tim Condon's amazing krautrock/noise band Fresh Snow, and recorded a little nachtmusik in a tiny cottage in a tiny town in upstate New York.